Joyful F riends Club is a student-led club that operates in a school in West New Britain, Papua New Guinea. Almost 1000 children attend this school. Students from every year level are selected to participate in Joyful Friends Club. The club has taken responsibility of assessing each classroom to make sure Hygiene Corners are stocked with toilet paper and soap. They have painted hygiene message murals on the walls of their toilet block, and successfully advocated with the teachers for the toilet doors to all be repaired so everyone has privacy when going to the toilet. The students in the club also serve as prefects for the school – conducting hand-washing demonstrations, making sure soap is on the toilet sinks, taking charge of the school gate, making sure rubbish is collected, and toilet cleaning responsibilities are fulfilled. 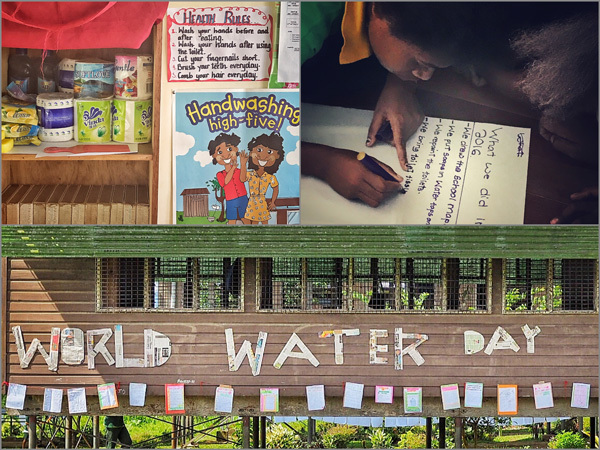 On World Water Day the school used the tools in the Arts for Advocacy guide to celebrate the importance of water. Students prepared poster displays, wrote special songs and conducted drama performances. Members of the Joyful Friends Club spoke to the full student body to share reasons why water is so important for life, and why it should be protected. Groups of students performed songs they had composed specifically for the day. Their proud teachers wore wide smiles during the performances. One teacher commented: “A few years ago these students were fighting. Now they are singing their own songs and being leaders for the other students. We are growing future good citizens in this school”, one of the teachers told me. An original song composed and performed by these guys in the WASH in Schools student advocacy club for #WorldWaterDay!